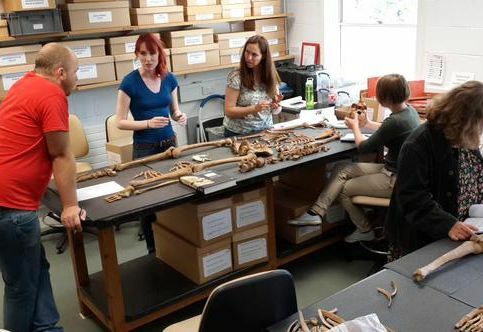 Our first group of interns working on skeletal bioarchaeology started today – focusing on the human skeletons from the Anglo-Saxon cemetery at Great Chesterford in Essex. During the 3 week internship, topics to be covered by Dr Ellie Williams & Sarah Stark (with occasional help from others including Alistair Pike and Sonia Zakrzewski amongst others) will include ageing and sexing of human remains – and all the problems and issues that arise in trying to do this. The focus for today (day 2) is on trauma – fractures and dislocations – and what happens to the body when people break their bones. How does the body react after a bone is broken? How do we identify the action (or direction of stress) that caused the break? How much healing has gone on? How long did the person live afterwards? How can we tell if they used the broken bone? 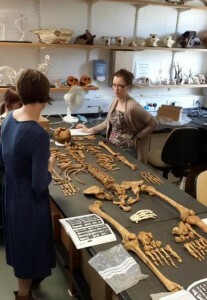 One Response to "Bioarchaeology & Osteoarchaeology @ Southampton Interns (#BOSI)"